Google chairman Eric Schmidt recently boasted at Le Web that “Android is ahead of the iPhone.” And that may be true in terms of how many mobile devices with the Android operating system are being activated daily (550,000 versus 450,000 daily for Apple’s iOS, at last count). If Android has the numbers, why aren’t more developers flocking to Apple? The answer is simple. They make more money on Apple devices. MG suggested as much in a recent post based on anecdotal evidence, but now we have some real data to back that up as well. Flurry, which has 135,000 apps across both Android and iOS using its analytics, just released some very interesting comparison numbers. It looked at a sample of in-app purchase data from apps with more than a million daily active users with versions on both Android and Apple. 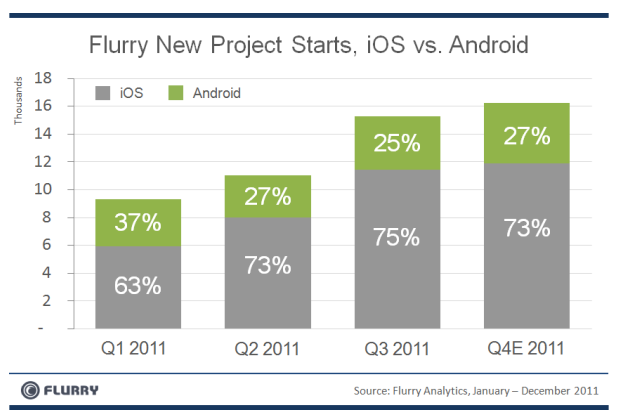 Flurry found that the Android apps produced only 24 percent as much revenue as the same apps on iOS. Flurry doesn’t say what the sample size was, and this only measures in-app purchases, not paid downloads, for instance. So it is not conclusive, but it does suggest why developers are still sticking with iOS. Looking at the 50,000 apps for which developers set up analytics in 2011, iOS continues to dominate, representing three quarters of new project starts in the past six months.